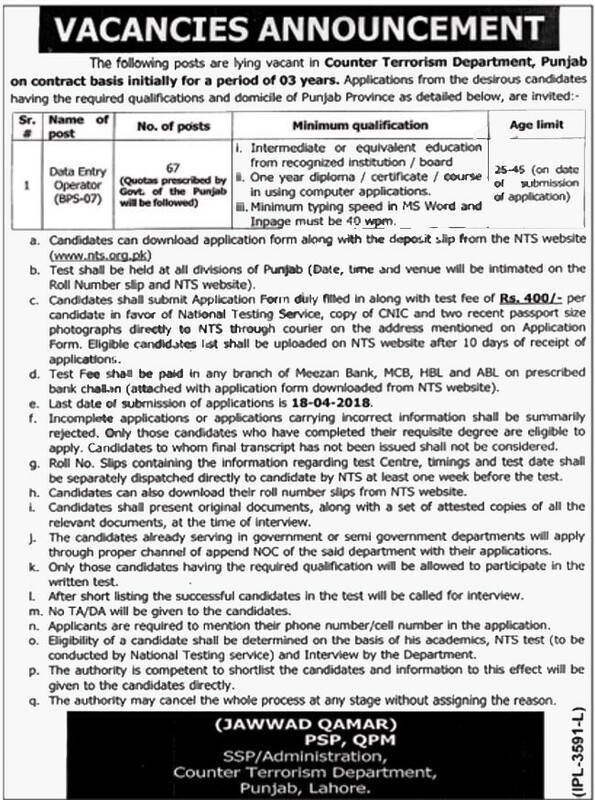 Application are invited for following posts in Counter Terrorism Department CTD Punjab Police Jobs 2018 through NTS website. Only Punjab domiciled candidates are allowed to apply and selected candidates can be posted anywhere in Punjab. Intermediate or equivalent education from recognized institution/board. One year diploma/certificate/course in using computer applications. Minimum typing speed in MS Word and Inpage must be wpm. 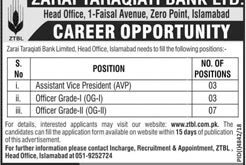 Candidates may download an application form and a deposit slip from the official site of NTS which is ww.nts.org.pk or it can be downloaded from our site alljobspk.com. Duly filled application form along with a copy of CNIC and two recent photographs should reach on the following at NTS Headquarter, 1-E, Street No. 46, I-8/2, Islamabad. Candidates have to attach with application form original paid deposit slip of Rs. 400/- in favor of NTS. Test fee can be paid in any online branch of HBL, MCB, ABL, Meezan Bank across Pakistan. For Test Date / Candidate List / Test Result keep in touch with our site All Jobs Pk.